Learn how to recover corrupted PQI USB 2.0 flash drives that have format errors .Download Dr UFD USB 2.0 format tool and restore your damaged PQI USB stick. Dr UFD USB 2.0 format tool is designed to restore PQI UFD for USB2.0 Flash drives .If you have PQI format errors ,you can use this recovery tool .Dr UFD USB 2.0 recovery tool can restore PQI flash drives and make maintenance and upgrade PQI flash disk firmware . Dr UFD PQI USB 2.0 format tool can fix spurious bad block error .Dr UFD format software support Windows XP ,Windows Vista and Windows 7.There is another version of Dr UFD for formatting PQI USB 2.0 flash drives . How can repair PQI USB 2.0 flash drive? 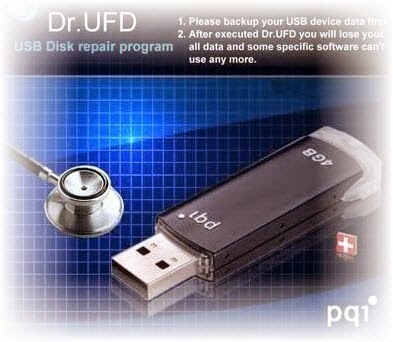 First you must download Dr UFD PQI USB 2.0 format tool from download links below . Plug in your corrupted PQI USB 2.0 flash drive to your computer . Extract zipped folder and run Dr UFD USB 2.0.exe . Click Update to start reformatting PQI USB2.0 Stick . Wait until finish upgrading PQI firmware .